When Isabel Allende, Chile’s most famous literary export, writes about her spindle-shaped country as a “land of mystery and magic,” it is easy to believe her. A land of spectacular beauty, Chile today is on the threshold of a brave new emergence, having moved away from the excesses of the dark days of dictatorship. Thanks to far-reaching social changes and economic expansion, as well as an abundance of natural resources, the country is already considered an emerging leader in the region and is looking to play a greater role on the world stage. Chile’s geographical peculiarities and remoteness are a matter of pride and identification for its people. The very word ‘Chile’ is said to be derived from the native Aymará word ‘chilli’ meaning “the land where the earth ends,” and this sense of physical isolation is often glorified in popular legends. A famous legend goes that in the beginning of time, God created the world and when he was finished, he had some leftover pieces. He had some rivers, valleys, glaciers, deserts and mountains. Instead of letting them all go to waste, God put them all together and cast them to the most remote corner of the earth, and thus Chile was born! 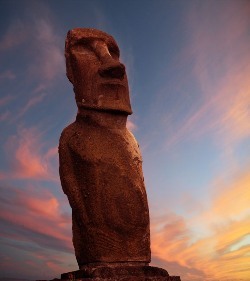 The grand monolithic statues on Easter Island in the Pacific Ocean are believed to have been sculpted as a tribute to Chile’s earliest settlers. Spanish invaders subjugated native inhabitants in the 16th century and laid the foundation of modern-day Chile. Many Chileans today refer to their country as ‘the end of the world’ but it is a world where, if certain hard-to-confirm evidences are to be believed, human habitation dates as far back as 33,000 years. But officially, the oldest inhabited site in the Americas is located at the Monte Verde site in Chile, where a 12,500-year-old child’s footprint left behind in a marshy field was discovered in 1998. Chile’s most famous earliest culture is that of the nomadic Chinchorros who lived in Northern Chile between 5000 BC and 3000 BC and who left behind the world’s oldest-known mummies. Another important civilization was the Atacameño culture, which flourished in Northern Chile between 2000 BC and 1000 BC. This civilization too left remarkably well-preserved mummies. The Incas had a short period of rule in Northern Chile but their invasions were fiercely resisted by the southern Picunches and Mapuches, tribal groups that inhabited what are now the regions in north and south-central Chile, respectively. But it was the Spaniards who invaded Chile in the real sense of the word. The Spanish invasion in the mid 16th century changed the course of history in Chile, and indeed of many parts of South America. Though relatively few in number, the invaders from Western Europe were ruthless and determined, and they subdued Chileans by a combination of exploitation and the threat of warfare. Thus, the all-conquering Spaniards established Santiago, the current capital of Chile, in 1541. However, barely six months after the city was founded, the Mapuches, or Araucanians as the Spanish called them, struck and razed almost the entire settlement. The Spaniards, though, clung on and by 1553, many more settlements had sprung up and the foundation for a new society had been laid. Gradually, the Spaniards attained supreme dominance in Central Chile and established a strict system of control in Northern Chile (then in Peru). Eventually, children of mixed parentage began to outnumber the indigenous people, who reduced in numbers rapidly because of large-scale epidemics and warfare. Gradually, there emerged a Chilean creole class — the Mestizos or people of partly white ancestry — who sowed the first seeds of the fight for independence from Spain. On September 18, 1810, at a town meeting in Santiago, Chile took a tentative step towards independence when a group of locally elected leaders replaced the governor appointed by the Spanish. Therefore, September 18 is celebrated as the Chilean National Day. The cry for independence from Spain grew louder across South America by the 1820s. Jose de San Martin, one of the great heroes of Argentina’s war of independence from Spanish rule, marched into Chile and occupied Santiago. A curious trivia is that, Bernardo O’ Higgins, the illegitimate son of an Irishman who had served the Spaniards as the Viceroy of Peru, was appointed as the second-in-command of Jose de San Martin’s forces and it was O’Higgins who later became the supreme director of the new Republic of Chile. A declaration of independence was officially issued by Chile on February 12, 1818 and formally recognized by Spain in 1844. Under O’Higgins, Chile gradually began to achieve political and economic stability. 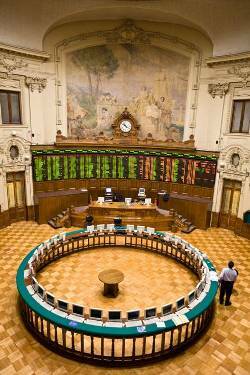 The Santiago Stock Exchange, which has been in business for over a century now, perhaps best exemplifies Chile’s resilience. A major fillip to Chile’s fortunes came from the spoils of the War of the Pacific (1879-84) during which time the country annexed vast copper- and nitrate-rich areas from Peru and Bolivia. Soon after that war, a global nitrate boom brought prosperity to the country, and an efficient railroad system further fueled the economy. This victory is still celebrated with great fervor by Chileans. Even today, copper is the cornerstone of the Chilean economy. O’Higgins dominated Chilean politics in the years after independence but the landowning elite who first supported him later objected to his rule due to higher taxes. He was replaced by a de facto dictator Diego Portales whose Constitution, which centralized power in Santiago and introduced indirect elections to the presidency, lasted until the early 20th Century. In the early decades of the 20th century, Chile’s economy suffered a near-collapse as the demand for mineral nitrates fell. What’s more, a dictatorial general called Carlos Ibáñez del Campo held power for a few years, and during his rule, Chile’s economic woes increased. The Great Depression worsened the situation and the country plunged into a period of widespread opposition and riots until World War II came as a godsend. The war boosted the demand for Chilean copper and the country’s economy quickly recovered. In the subsequent years, Chilean politics grew increasingly polarized, complicated and confrontational. In 1970, Chile saw one of its most fiercely fought elections, which resulted in socialist leader Salvador Allende becoming the world’s first democratically elected Marxist president. But the country was far from being peaceful. In 1972, what began as a truckers’ strike led to unimaginable consequences. Faced with the prospect of losing power, Allende invited the army commander, General Carlos Prats, to join the Cabinet. But the crisis ballooned into an unsuccessful military coup in 1973, ultimately leading to the resignation of General Prats and the appointment of Augusto Pinochet Ugarte, then an obscure General, as army commander. In September 1973, Pinochet unleashed a brutal coup d’état during which numerous Allende sympathizers were rumored to have been herded into the Santiago National Stadium to be beaten, tortured and executed. Hundreds went into exile. Pinochet appointed himself president in 1974, and thus began Chile’s darkest days of widespread repression, torture, and murder. He is believed to have organized a ‘caravan of death,’ a military group that travelled from town to town, city to city, ruthlessly hunting down political opponents, even those who had surrendered. Thousands ‘disappeared’ during this reign of terror. In 1980, Pinochet organized a controversial plebiscite, which approved a new constitution and proclaimed him president for an eight-year term. In the early 80s, cracks appeared in Pinochet’s dictatorship and murmurs about democracy began to get louder. Eventually, in 1988, a much-weakened Pinochet held a plebiscite seeking a second eight-year term as President. He lost. In December next year, democracy returned to the battered country when Patricio Aylwin, the coalition candidate of a group of opposition parties who called themselves the Concertación para la Democracia, defeated Pinochet’s protégé Hernán Büchi for the post of president. Slowly, Aylwin consolidated the re-born democracy, although there was a constant struggle between the ruling government and the actual Constitution that still accorded the military considerable powers. Over the next two decades, the center-left Concertación managed to win successive elections, holding power for four consecutive terms. Two important political events took place in these twenty years. In 2005, Chile carried out constitutional reforms on 58 grounds, with one of the key changes being the reduction of the presidential term from six years to four years. Secondly, in 2006, Socialist Party leader Michelle Bachelet, a Concertación nominee, won the presidential elections to become Chile’s first woman President. Bachelet governed until early 2010 when the center-right Coalition for Change’s Sebestian Pinera, a well-known businessman who owns a TV station, a football team and a 25 per cent stake in the Chilean national airlines LAN, was elected president. One of the salutary effects of the Pinochet regime was its pro-market agenda. The dictator started reforming the economy and gradually pushed Chile toward a free market system. Fortunately, the four democratically elected presidents of the Concertación coalition who followed Pinochet did not completely abandon the dictator’s legacy. Just as the Pinochet regime had sold many state-owned firms, the subsequent democratic governments continued privatization, albeit at a slower pace. They also consistently retained some of the sound economic policies that were implemented in the 80s. With newfound economic and political stability, the Chile of today is very different from what it was during Pinochet’s rule. The country is ranked among the forty most developed countries, its economy is robust, healthcare has improved, life expectancy is up and poverty has been halved. Socially as well, Chile is embracing modernity and casting off old biases. Despite its many achievements, though, the country has a long way to go in terms of reducing economic inequality and tackling tensions, which keep sparking between the State and the people of the indigenous Mapuche community. Incidentally, whites or people of pure European descent and the Mestizos or people of partly white ancestry together make up 95% of Chile’s population of 17 million. The country’s indigenous inhabitants, of whom 80% are Mapuches, account for the remaining 5% of the population. Having suffered and endured ruthless invaders and dictators throughout history, Chileans view themselves as a brave and resilient society. The biggest day of riotous celebration in the Chilean calendar is also linked with national identity. The ‘18’ as the Chileans call it, is celebrated on the Chilean National Day — September 18 — with great joy and fervor. It is the day Chileans go out on the street to make merry, sing and dance the Cueca, the national dance, and eat empanadas (meat pastries) by the dozen. And of course, gulp down bottles and bottles of Chilean red wine. On the ‘18,’ many dress up as the typical Chilean cowboy Huaso, a symbolic figure who wears a wide flat-topped hat, multi-hued ponchos and shiny high-heeled boots with spurs. In fact, the festivities begin a week earlier, with many fiestas patrias (patriotic parties) held during the week. These celebrations include colorful cowboy parades, lots of folk music and dance, and not to forget, traditional Chilean delicacies. A major part of the celebration takes place in public gatherings in Ramadas, which are temporary shacks with roofs made from tree branches. These Ramadas usually have a dance floor, rhythmic music and tables to eat. Typical Chilean fare such as empanadas and anticuchos and drinks like chichas and piscos (fermented apple brew and grape brandy) are served in these shacks. 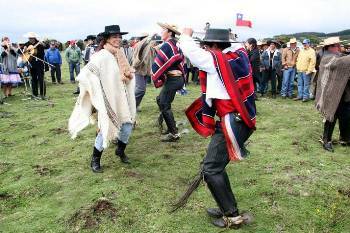 Young Chileans enjoying Cueca, their country’s national dance. Like in most ancient cultures, food is accorded special respect in Chile. Chilean cuisine too is a mesh of its Indian and Spanish influences and speaks for the unique sense of cultural homogeneity that Chileans are justifiably proud of. The national dish Porotos Granados is a delicious mixture of locally produced corn, squash and beans with a dash of the Spanish in the sprinkling of onion and garlic. Another popular national delicacy is the caldillo de congrio, a soup made of conger eel, tomatoes, potatoes and a melody of herbs and spices. Traditionally, Chileans eat four times a day, with a unique meal called “once” usually eaten between 4 p.m. and 7 p.m. Once is a light meal typically consisting of sandwiches with cheese and avocados accompanied by tea or coffee. A cheeky tale recounts that long ago, men wanted to drink their liquor during the day and once was created to give them the liberty to do so. According to Chilean lore, it is pointed out that the word liquor in Spanish is aguardiente and the number of letters in aguardiente is eleven, which translates to once in Spanish! Interestingly, Chilean Spanish is slightly different from the Spanish spoken in other Latin American countries and has a distinct ‘melody’ to it. And that melody is representative of everything about Chile – a place where contrasting cultures, geography and peoples have all fused harmoniously to create a sense of magic. The market-oriented economy of Chile is a rare success story in South America. The economy stands out for its buzzing foreign trade, solid financial institutions, social welfare measures and sound fiscal policy. Thanks to its free-trade policy, the country has emerged as one of the world’s most open economies. Chile inked a free trade agreement with the United States in 2004, followed by the signing of the deal with some 60-odd countries that include India, China, South Korea and Mexico as well as with economic blocs such as the European Union. Chile is also a participant in the Trans-Pacific Partnership, an ambitious trade agreement to enhance trade and boost economic growth among twelve Pacific Rim nations. Chile was the first country in Latin America to privatize state-run enterprises, reduce tariffs and allow foreign capital. The country also enjoys the distinction of being the first from South America to join the Organization for Economic Co-operation and Development (OECD). Chile has recorded extraordinary economic and social progress over several decades, with real growth averaging close to 5% a year since the 80s with the exception of the financial crisis in 2009 and the commodities downturn. The average income among the poorest sections of the population rose by 4.9% between 2003 and 2014, according to a World Bank report. Likewise, the percentage of Chile’s population considered poor fell from 7.7% in 2003 to 2% by 2014, the report said. Containers ready to be shipped at a Chilean port. 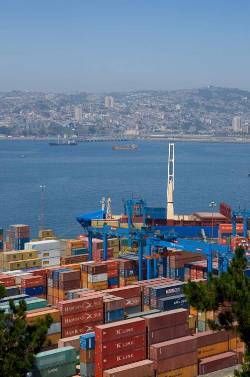 Chile boasts of a free trade policy that gives its access to numerous markets across the globe. Moreover, the country boasts of a privatized pensions system, a guaranteed minimum income for the elderly, an effective poverty eradication program and provision of public health services. The number of young people going to universities also shot up during these years. Foreign investment flowed into the country and inflation was reined in. Thanks to the remarkable progress achieved during the period, Chile is now widely considered one of the world’s most stable emerging market economies. Chile’s sound fiscal policy has kept the economy grounded during its highs and lows. The surpluses accumulated from higher prices of copper have enriched the country’s sovereign wealth funds over the years. Chile’s large sovereign wealth funds helped the country finance fiscal stimulus packages during economic downturns, according to a write-up on the economy from the Central Intelligence Agency’s website. According to a CIA article on the Chilean economy, exports of goods and services contribute about one-third of the country’s GDP. Commodities account for about 60% of Chile’s total exports, with copper alone contributing 20% of government revenue. Industrial goods contribute 26%, fish and fish-meal bring in 9% and agricultural products add around 6% of its revenues. Chile has approximately 34% of the world’s copper. Naturally, copper has been the main export of Chile for close to two centuries. Chile is not only the world’s largest producer of copper, but is also home to the globe’s largest open-pit copper mine, Chuquicamata and the largest copper mining company Codelco. With copper reserves that are estimated to last about 200 years, Codelco produces a fifth of the world’s copper ore every year. The state-owned company’s primary output is 99.99% pure copper cathodes. Codelco is also the world’s largest producer of rhenium and second-largest producer of molybdenum, both byproducts of copper mining. Thanks to the bounty of nature, Chile has a large and flourishing fisheries industry. Due to its low temperatures and the Antarctic current to its south, Chile has the purest and most oxygenated marine waters in the world, an environment where 1,016 species of fish thrive, including the renowned Chilean Sea Bass. The country’s fisheries exports have been growing largely due to the evolution of the fishmeal industry over the past fifty years. Frozen seafood products make up nearly 45% of Chile’s fisheries-related exports. The country is also a large exporter of fishmeal, fresh refrigerated products, fish oil, canned products and dried algae. Chile sends its fish products to 93 countries worldwide, but nine of them account for a whopping 81.8% of its total fish exports. Among these, Japan, the United States and China are some of the biggest buyers. Chile accounts for about 4% of the world’s total exports of fish products. Besides the dominant minerals sector, agriculture is also an important segment of the economy. About 15% of the country’s population is employed in the agricultural sector. The Vale of Chile, which has the highest population density as well as great agricultural and industrial output, is the nation’s agricultural hub. The area’s vineyards are the primary suppliers to Chile’s flourishing wine industry. Chilean wines are global brands, well-recognized in major markets such as the U.S. Besides grapes, apples, pears and peaches, the country also produces beans, onions, garlic, oats, wheat, corn and asparagus in the region. Historically, Chile’s economy and global copper prices have moved in lockstep. For instance, between 2003 and 2007, Chile recorded strong annual GDP growth on the back of high copper prices. Conversely, when copper prices halved at the peak of the global financial crisis in late 2008, Chile saw a dramatic fall in its exports as well as GDP. Despite its success in alleviating poverty to a large extent, Chile still has a long way to go in enhancing per capita incomes. Chile’s per capita income pales in significance when compared to higher-income countries in the OECD club. Chile’s energy deficit is huge as it does not have much oil and natural gas, while its hydro-electric projects are hampered by severe droughts. To make up for the shortfall, the government has launched an ambitious program to harness non-conventional renewable sources such as geothermal energy from the numerous natural geysers and steam fields located in the northern part of the country. With the exception of the seventeen-year military rule under General Augusto Pinochet, Chile has continued to elect democratic governments over the years. Sound economic policies followed by successive governments since the 80s ensured steady economic growth, thus securing Chile a prominent position among the world’s emerging economies. Most of all, the strength of Chile’s institutions endear it to the global investor community. To sum up, Chile’s economic fortunes are likely to continue to depend largely on its status as a South American commodity power house in the years to come.